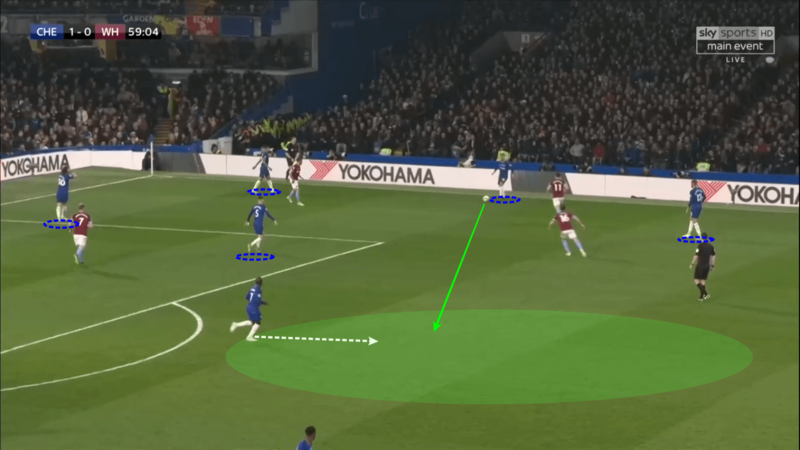 Home Match Analysis How did Chelsea finally deliver Sarriball? West Ham started with their best side at the moment, relying mostly on their good defensive block that was anchored by Declan Rice and transitions to their skillful players. Marko Arnautović and Felipe Anderson were the biggest threats for the opposition but they didn’t get much action due to their team’s style of play. As we have witnessed, Sarri hasn’t been pragmatic at all throughout the season in getting his players used to playing the way he wants. This approach finally paid off for him in Monday’s London derby though when his team went full Sarriball and controlled the midfield with their fast ball movement. The key to the success of the Italian’s ideology in this match was the great deep positioning of N’Golo Kanté and Ruben Loftus-Cheek. They managed to find gaps between the opposition lines and were always available as passing options for Jorginho and their centre-backs. 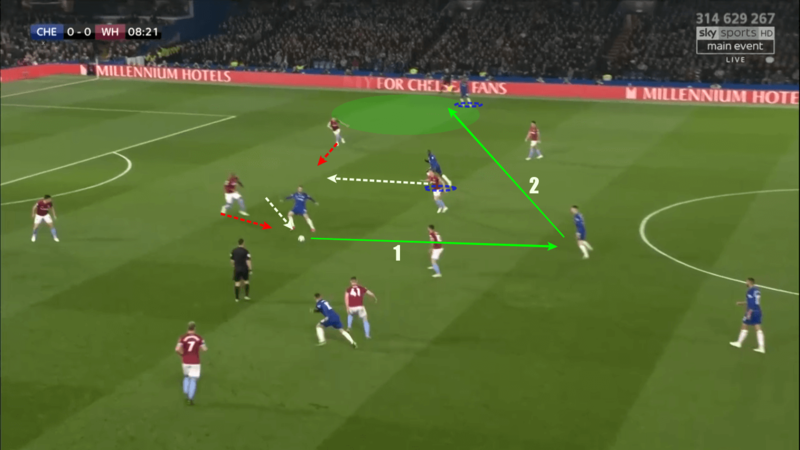 Loftus-Cheek drops and plays a role in the build-up, while Kante positions himself between West Ham’s lines. The two midfielders played as if bound together, so when one was searching for room in the half-spaces, the other came lower to get the ball. As we can see on the picture above, one of them was always in position for the attack to progress, either through the lines or out wide. Eden Hazard’s role was also of huge importance to Chelsea breaking West Ham’s defensive block. 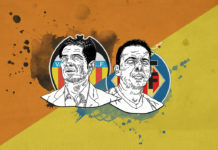 He was free to search for empty pockets all over the opponents’ half and often positioned himself in the inner corridors, confusing players from the visitors’ defensive block in terms of how to defend him. 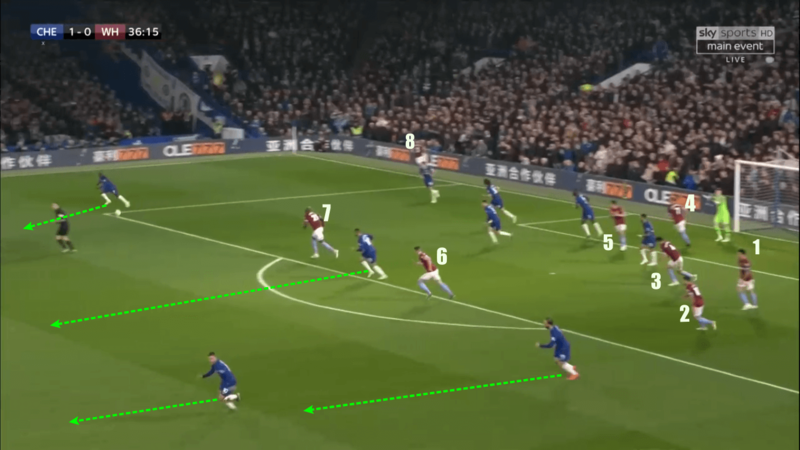 Chelsea’s midfielders lock West Ham’s players to themselves and create space for Hazard who finds space out of his position to get the ball. His teammates created overloads on the flanks trying to lure opponents into watching them instead and free up space for their best player to get the ball. The Belgian’s constant movement made it difficult for the visitors to predict where he would position himself, and that created lots of trouble for them. Chelsea’s number 10 was very successful playing as an inverted winger since he found a lot of action while positioning in the half-spaces. That made an advantage for his team because he used the room he was left with to get forward and be a threat to Fabianski’s goal, either through his passing game or with his dribbling. Hazard finds a huge gap in West Ham’s defensive block and exploits it. Security on the ball made it possible for Sarri’s team to play in the way they had planned. They succeeded in breaking the away team’s press with their calmness when in possession and good sense in finding gaps in the opposition’s press. Chelsea players are calm on the ball as they overload the left-hand side and break through West Ham’s press with ease. The ease with which the home team played against Pellegrini’s team’s press was a very significant part of this match. They managed to progress through their lines without significant problems, always having one midfielder available for the attack to prosper. The Blues dominated the game with the good movement of their attacking players. 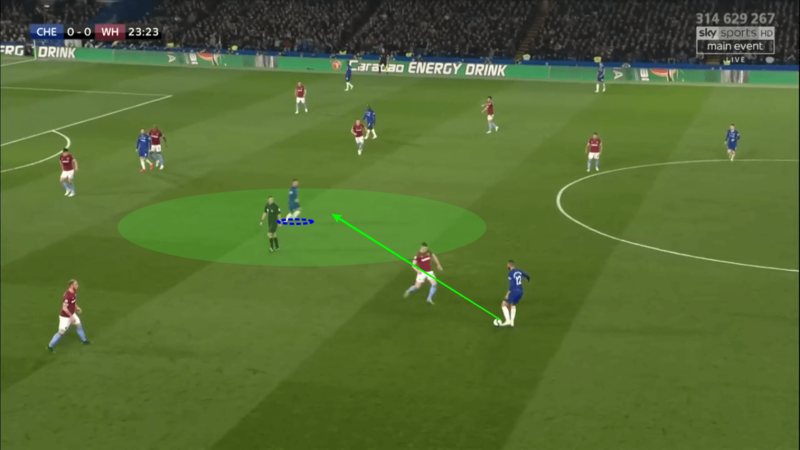 Higuaín and Hazard were constantly in motion, confusing West Ham’s defenders and making it possible for his team to get forward with their attacks. The most important movement of Chelsea’s attackers was dropping their striker in order to pull the opponents’ defenders out of position. That created the space for midfielder run-ins which Loftus-Cheek and especially Kanté did brilliantly. Higuain drops and drags the defender with him which creates free room for Kante to run into. In the picture, we can see the Argentinean coming deeper and making room for Kanté to exploit space behind the defenders. Sarri has done a great job developing the Frenchman into a world-class box-to-box midfielder which was evident in this match. Kanté continuously attacked those spaces from the midfield zone and was a huge threat to the opposition. His movement was dangerous for them whether he got the ball in good positions or drew a defender and created a new passing lane to Hudson-Odoi. Higuain pulls the defender out of position as Kante runs into free space and creates a passing lane to Hudson-Odoi for Jorginho. 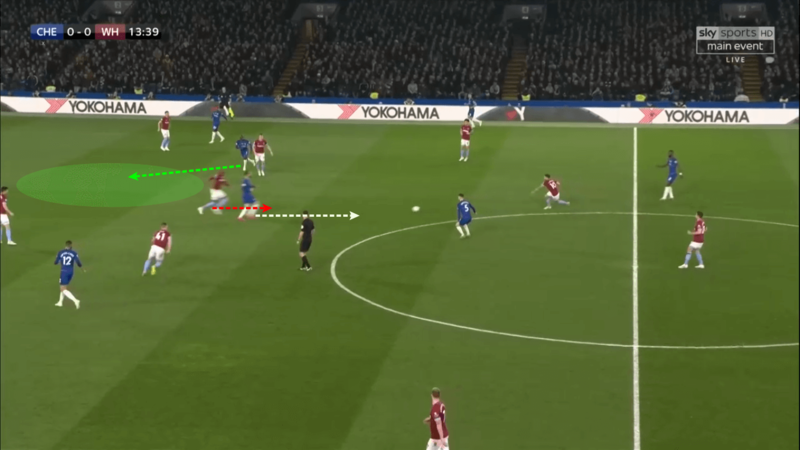 These situations happened due to Higuaín’s sense for the game which enabled them to perform rotations and great link-up play, which made the flow of the ball easier for Chelsea’s Sarriball. He also played a support role for his team when it came to breaking through the opponent’s press, positioning himself even lower and being the option for advancing the play. Higuain comes as support for his team-mates while breaking the opposition’s press, which draws the defender’s attention to him and thus frees space for Loftus-Cheek. The Blues succeeded in their attempt to play fluidly and beat the opposition with constant positional exchanges. The midfielders did a very good job using the spaces their attacker provided for them and got the better of West Ham by attacking the space that was left thanks to their rotation. 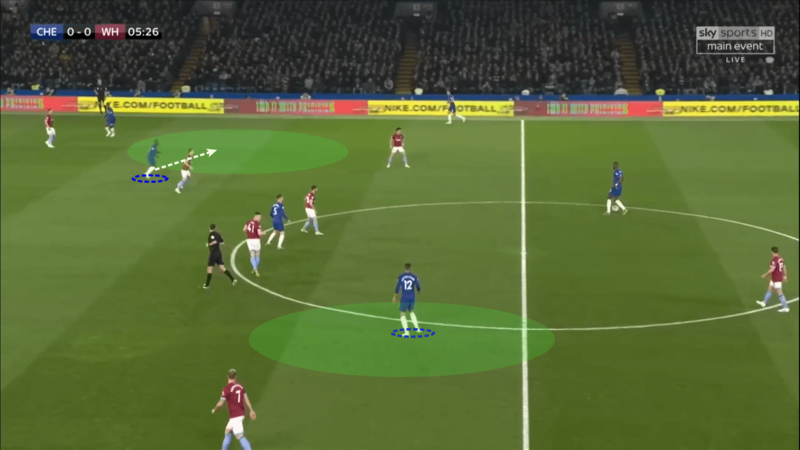 When Pellegrini’s team were in possession, Chelsea focused on their dense block and by pressing their opponents’ heavy touch. 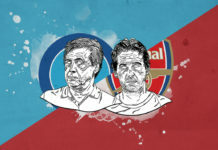 They often tried to draw West Ham into situations where they had no options to progress the attack, by standing firm in the block from which they could transform easily. Their basic idea was to press after the lost ball and to regain possession as soon as possible. 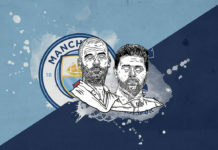 If they didn’t succeed in their initial intention, they stood high up the pitch closing down the midfielders with a man-marking organisation. Chelsea’s organised defence focuses on man-marking opponents at the beginning of the attack. 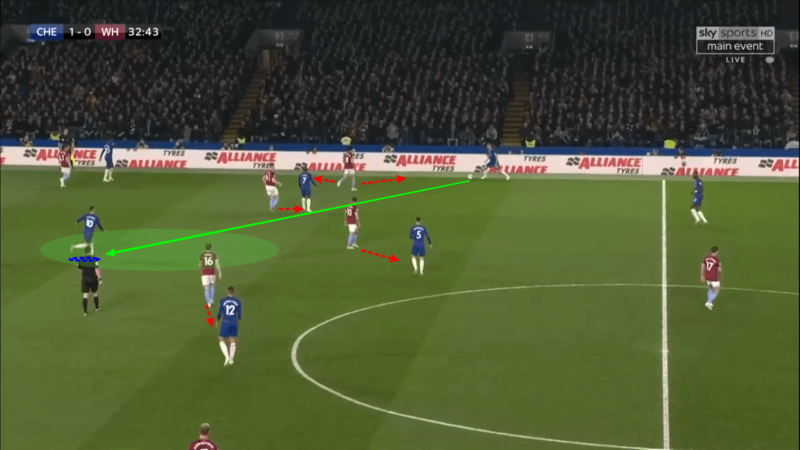 Sarri’s players tended to force the opposition to give them the ball back by making them play long in the absence of better options. 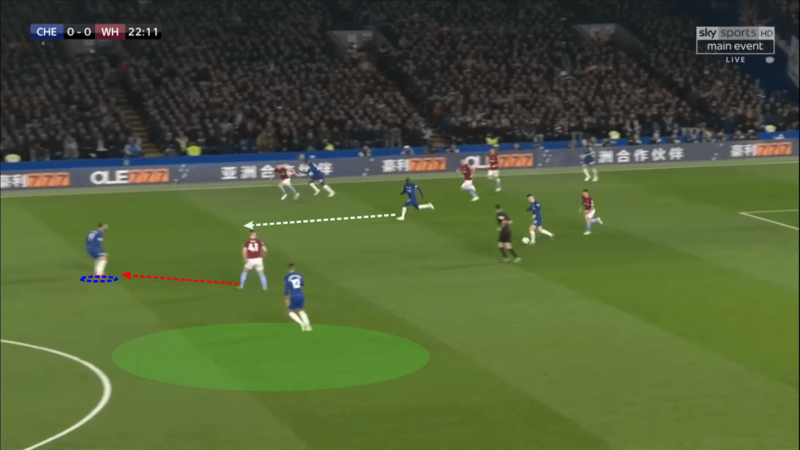 The main pressing target for them was Angelo Ogbonna who was often attacked by Kanté and Loftus-Cheek who popped out of the midfield zone with the intention of putting him under pressure. Kante forces Ogbonna into a well-planned press trap which leaves West Ham’s defender with no options except playing a long ball. They cut the passing lanes to Rice and Noble with their well-organised block and that broke up the visitors’ creativity. 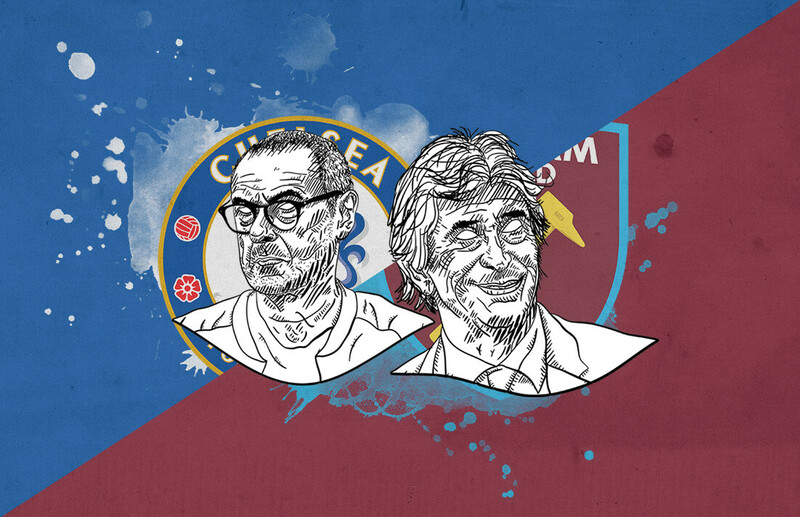 Chelsea’s midfield trio took West Ham’s midfielders out of the game and forced Pellegrini to try and play in a different way than he had planned. Chelsea came into a few good goalscoring situations from good transitions after regaining possession in their own half. The home team rapidly transformed from defence to attack with the help of their pacey players such as Hudson-Odoi, Hazard and Kanté. Chelsea use a numerical advantage over their opponents and quickly transform into a transitional shape. 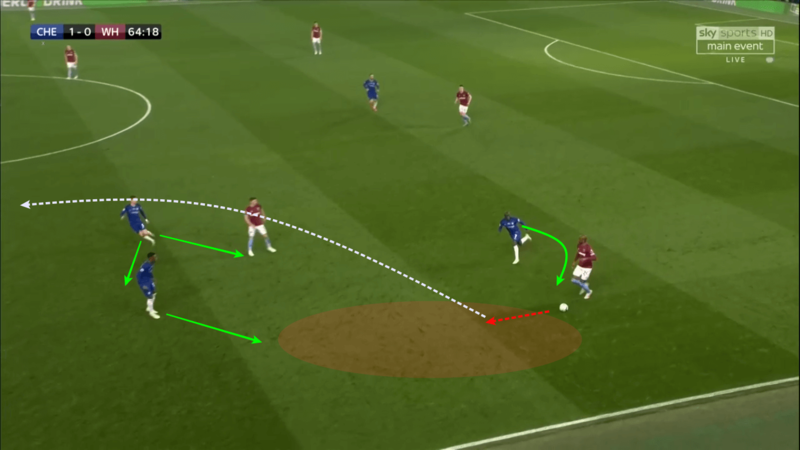 Kanté and his teammates used situations like the one on the image to take advantage of the away team’s defence that didn’t have time to organise and was numerically inferior. He played a great role in leading those attacks and making them progress very quickly. Sarri finally succeeded in his idea of playing positional play that was as direct as he wanted. 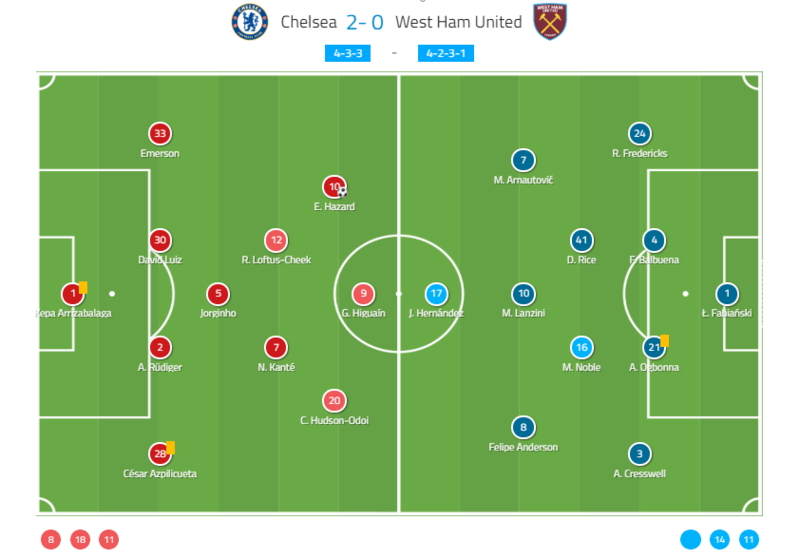 Chelsea managed to get the better of their opponents while fully dominating the pitch using well-planned attacking patterns and exploiting the gaps in West Ham’s defence. Pellegrini’s team didn’t have many chances since the game went precisely how the home team wanted. Kanté adapted to the position his new coach has insisted he play in, and in this match he has shown that the Italian had every right to believe in him becoming a world-class box-to-box midfielder. He and Loftus-Cheek played key roles in Sarriball that worked pretty well after the long period of getting used to it. It looks like they have at last found the midfield they have been searching for throughout the whole season. Previous articleCan Martin Schmidt fix Manuel Baum’s defensive problems at Augsburg?